Can someone say, “Hello Fall? !” The leaves have changed and the rain is here! This is my absolute favorite time of year, scarves, boots, staying indoors and cooking/baking galore. Last night I was feeling crafty so in between a few DIY bedazzled pumpkins I made this DE-LI-CIOUS veggie soup to coincide with the rain that was on it’s way. I had a friend over who tried the soup, and was pleasantly surprised extremely pleased by the results (as if I don’t know how to cook haha). If you are eager for more protien you can always add chicken (organic preferred) to any recipe, or simply leave it as it (I recommend). It was filling and hit the spot just perfectly. This is super easy and is also great as leftovers. Enjoy! Start by sauteing carrots, onions and celary in pan with olive oil. I do this until the onions turn a little brown. I transfer this into a pot and add the can of diced tomato. From there I add water into pot (amount should be above level of veggies). Some people use veggie stalk- I don’t like the taste so I use water. I use the pan that I cooked the carrots, onion and celary (mirepoix)- add a little more olive oil and throw in potatoes. You can cook potatoes in pot w/out sauteing first, but will just take longer. I saute the potatoes for about 5-6 minutes on a med heat and then combine with pot of soup. Add salt, pepper, garlic powder, dried oregano, dried parsley and red pepper flakes for a kick (optional). 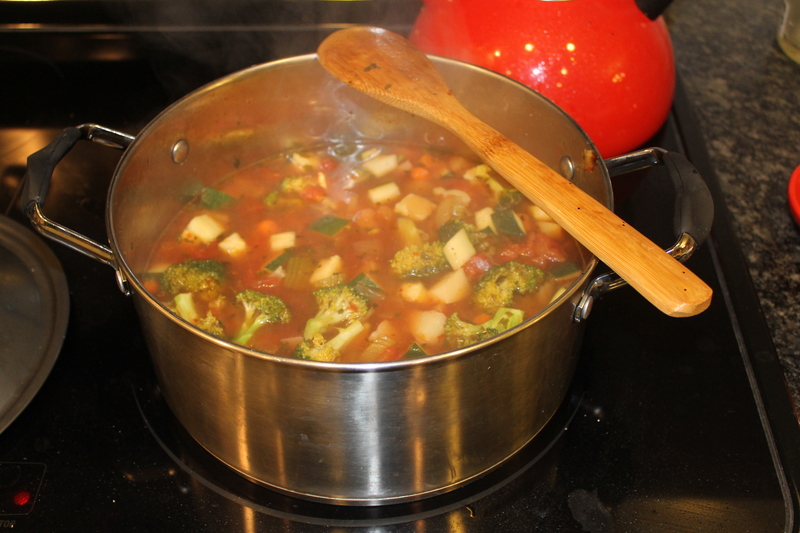 When soup is near done (you can taste a potato to see if cooked) I then put the zuchini and brocoli. (I prefer those two veggies not to be overcooked & because they cook fast- they go in last). Remember to go easy with the spices (especially salt- you can always add more later). The longer the soup cooks, the more you will be able to taste the flavor. 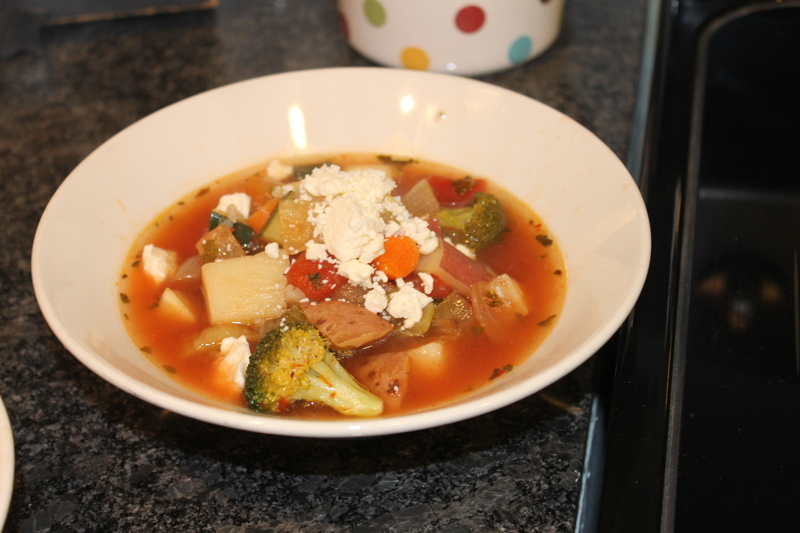 I usually add a dash of everything to begin- and then when the soup has simmered a bit- add what I see fit! Feta cheese optional for garnish!